We're back with yet another edition of our weekly article and either you people keep reading them or Across The Pond Wrestling like having us around. Either way this weekend we're firstly heading to Northallerton for New Generation Wrestling's event on Friday. On Saturday we are once again going across the Irish Sea to Dublin for Over The Top Wrestling before finally rounding off hopping over to Wales where Dragon Pro Wrestling are in action in Newport. Let's get Ready For The Weekend! 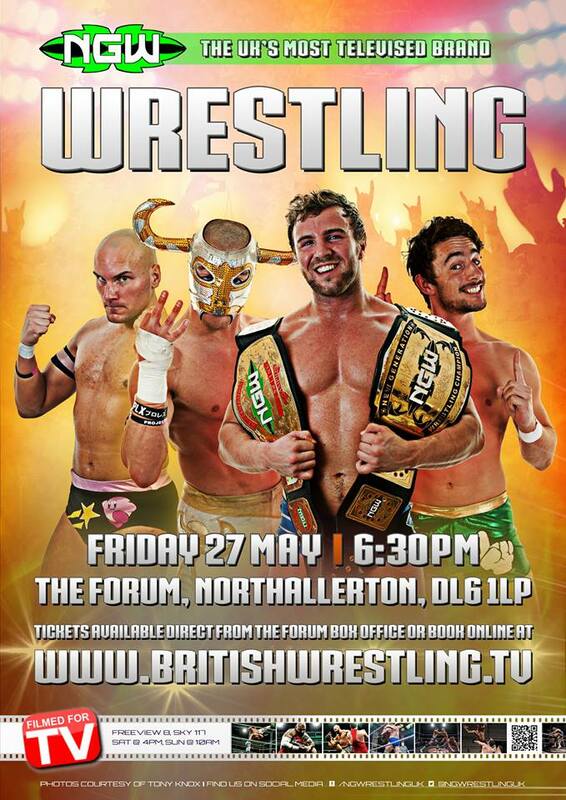 Kicking off the wrestling weekend and New Generation Wrestling will be at The Forum in Northallerton. The show will be main evented by the current NGW Undisputed Champion; 'The Showstealer' Nathan Cruz and Martin Kirby. In a different set of circumstances, Kirby could have been the man with the gold in this contest as he originally set to challenge Rampage Brown at NGW's last event at The Forum for the title. However, Cruz managed to become the champion before that happened. Now Martin Kirby gets to face the man at the top of the mountain and while the championship will not be on the line, a win would certain put Kirby in line for a future title match. Cruz will be focused on his triple threat championship defence that takes place just 24 hours later, but he certainly won't be ignoring the threat that Kirby poses. One of the men who will be challenging Cruz on May 28th will be Rampage Brown. He shall also be in action this Friday when he faces Liam Slater in a match that shall be a first between the two. Brown is hell-bent on destruction right now and nobody is safe from his wrath. His opponent in Northallerton will be the ever popular, Slater, a man who has had his own problems of late, mainly in the shape of Joseph Conners. While it would be wise for Slater to have eyes in the back of his head, if he's not looking at Brown then he might not have a head on his shoulders when Brown is finished with his this Friday. If Brown is dangerous, then Dara Diablo is just as dark. The man who once stood alongside the biggest and most loved names in NGW simply does not exist anymore. In his place, is a dark and dangerous man who is in full control of the demons inside him. His opponent is Matt Myers, a man who has a drive like he never has before. These two men meet a number of months ago and it was Myers who walked away with the win. Since then Matt Myers' ambition has grown with the fire inside him for success. The question now is can Matt Myers' fire still burn bright when it is face to face with the blackness of Dara Diablo's soul? 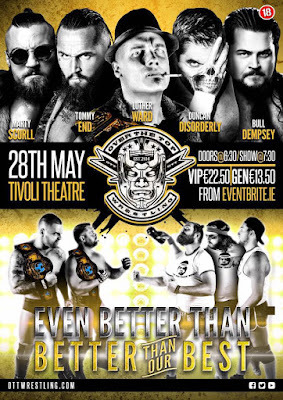 Moving on to Saturday and Ireland's Over The Top Wrestling are back in Dublin at the Tivoli Theatre. The night will see The Gymnasties hard work come to fruition when they final challenge The Kings Of The North for the OTT Tag Team Championship. The Gymnasties have had to win three matches in a row to earn this title fight and they're bound to give it everything they have to finally win the championship they have desired for so long. The K.o.t.N. on the other hand have held the championship for a long time and will have no plans on releasing them this Saturday. The fact that it was Dunkan Disorderly of The K.o.t.N. who was the last hurdle The Gymnasties overcame on their road to the championship match will only add to Bonesaw & Damien Corvin's determination to win and keep the gold. Pete Dunne was originally scheduled to face Zack Sabre Jr this Saturday but an injury has meant that Dunne was without an opponent. Well he's got one now in the shape of 'Iron Man' Joe Coffey. These two men have never met one on one and the only interaction they have had in the squared circle was back in 2014. In those two years, these men have grown in ever sense of the word. Both are now bigger, stronger and more experienced. 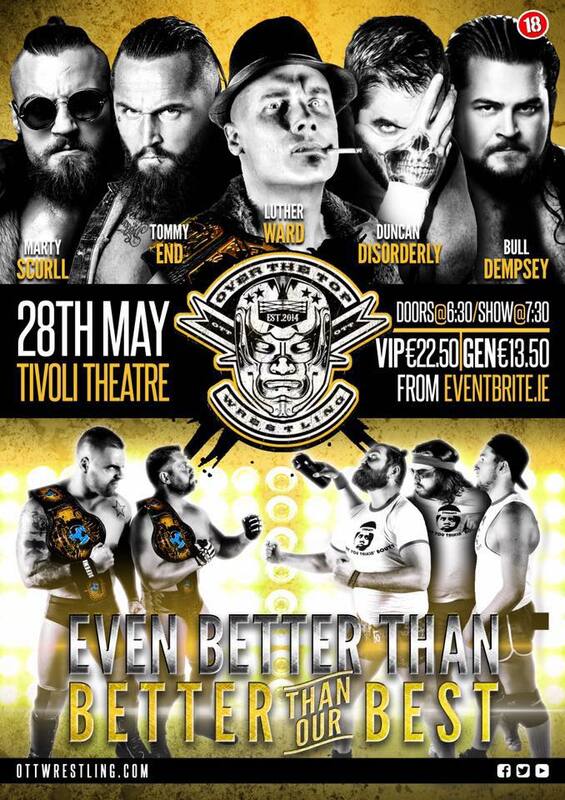 OTT is in one for one hell of a match in Dublin. The main event will see championship gold up for grabs as Luther Ward shall be putting the OTT No Limits Championship on the line against one of the most dangerous strikers in the world in 'Anti-Hero' Tommy End. Ward has been a mainstay of Over The Top Wrestling for a long time and is now in his second reign as champion. While known for his success as part of the Sumerian Death Squad, End has also held gold as singles competitor in multiple countries. This Saturday he will look to add another country to that list while Ward shall look to add another name to his list of men who have tried to take the championship from around his waist. The weekend rounds off with Dragon Pro Wrestling who will be back at their home of the Rodney Parade in Newport, Wales. 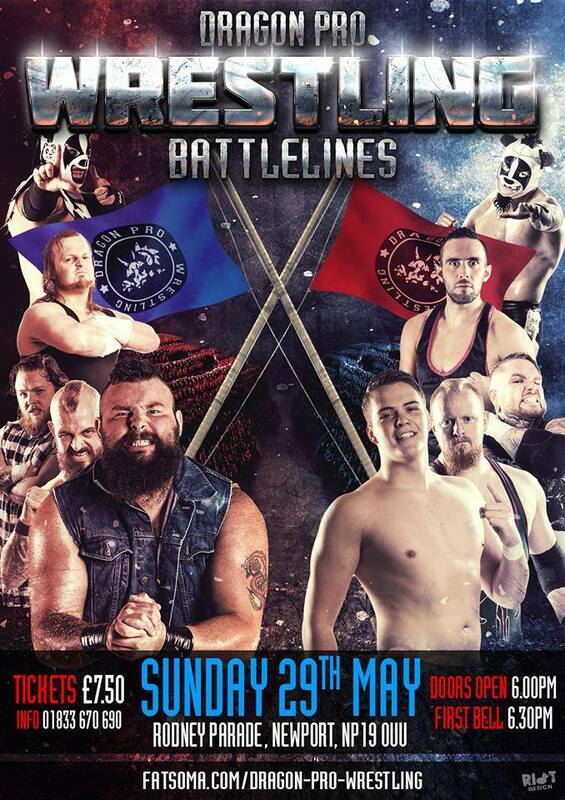 In the last 9 months, DPW have been having more regular events in Newport and 'Battlelines' will be the latest. The main event will see the head trainer of the DPW Academy, Mike Bird bring the best of the Academy in the shape of Danny Jones and Bishop to face the current All Wales Champion; Big Grizzly and two trainees who have turned their back on the Academy, Jonny Doe and Joe 'Messy' Mezinger. Bird has had enough of Grizzly cheating his way to win and now with the help of Doe and Mezinger, he's had enough. His partners, Jones and Bishop are two of the finest men to come from the DPW Academy in recent memory. Jones came very close to becoming champion until the aforementioned cheating stopped it. Bishop on the other hand is undefeated in DPW, defeating some of the best on the roster. Bird, Jones and Bishop look to send a message this Sunday that dirty tactics and disrespect will not be the way of Dragon Pro Wrestling. This Sunday will also see the continuation of the Celtic Crown Women's Championship tournament with two débuts. The first debut is Ciel Fontaine who carries a reputation of being a perfectionist with her work. That perfectionist trait has lead to her also being known as having quite a temper when things don't go her way. Her opponent and fellow debutante is Sierra Loxton, who is known for her very unique style, blending a mix of Lucha Libre and Joshi Puroesu to create vicious strikes that come with degree of showmanship. These two competitors will be a clash of styles, it'll come down to which style overcomes the other on May 28th and which debutante progresses to the next stage of the tournament. For a number of months, relations between former DPW Tag Team Champions; Panda Mask and Panda Cub have worsened. Things came to a head last month when they lost the championship to The Pure Breed. After that, things exploded between the two. This Sunday we're going to see one of the most popular tag teams in DPW tear themselves apart when they face each other one on one in Newport, Wales. This match may be less of who wins but rather who is the one to survive. Confirmed Entrants: ‘The Original Badman’ Beano, Oliver Sudden, Ian Williams III, Oliver Satchwell.